In 2010, when Citizens’ Climate Lobby brought 25 citizen volunteers to Capitol Hill, it felt like a big challenge to get enough people to go the distance, to meet with all 535 voting members of Congress. This year, we brought 36 times as many people, and it is looking more like we will need more elected officials to welcome and build relationships with all the citizen lobbyists coming to make democracy work. For the first time, we had more people attending than could reasonably fit into the meetings we had scheduled. We had nearly three times as many volunteers to role-play members of Congress in our basic training than we had volunteers total in our first conference. We heard from not one but two great scientists who have been named to TIME Magazine’s list of the 100 most influential people on Earth. We were joined by dozens of faith leaders, who came to support this message of enhanced civics and substantive policy for a livable world. Pope Francis released his Encyclical Laudato Si: On caring for our common home 5 days before we went to the Hill. On the morning of our Lobby Day, the Lancet released a comprehensive public health study that calls for pricing carbon as necessary to protect human health from now on. And, in one Republican office after another, we heard the message: we get the science; we want to talk about solutions. The people have a right to co-create policy with our representatives. Political analysts around the world have been noting the extreme negative tone of the 2014 midterm election campaign in the U.S. Outside groups that are spending hundreds of millions of dollars on smears and innuendo are degrading the political debate. The ugliness of the campaign has exacerbated the bitterness many Americans feel toward the political process itself. That bitterness tends to be connected to a feeling of detachment or of access denied. People believe they do not have access to their elected officials and that the parties do not respond to their day-to-day needs. This detachment is driven partly by the apparent inability of leading national political figures to work together, which leaves a great deal of important work unfinished. With over 600 volunteers, spending between 8 and 16 hours learning, strategizing and coordinating, the 2014 Citizens’ Climate Lobby Conference provided roughly 7,200 total hours of education. That time empowers volunteers to do better work as citizens on Capitol Hill, but also delivers that training, through them, to our local groups, all across the United States. On Friday evening and through Saturday, I had the great good fortune to spend quality time with our committed and tireless staff. A relatively small group of people working extraordinary hours with energy the origins of which are hard to trace, all to make sure this work of getting citizens to Capitol Hill can be accomplished. 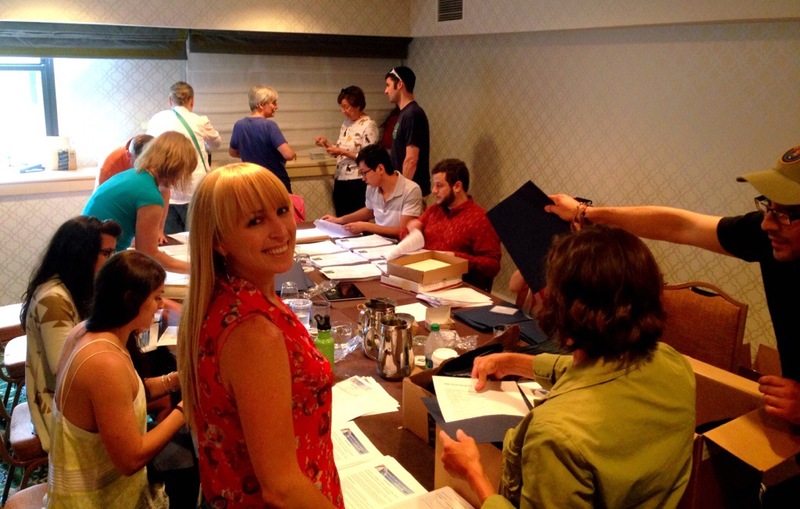 Sorting through handouts, filling folders, making name tags, coordinating the calendar of events, and facing the merciless but vital chore of getting volunteers’ schedules for Hill meetings worked out, so we can maximize our impact, were the work of those last hours. The Fifth Annual Citizens’ Climate Lobby International Conference in Washington, DC, spanned a week, with meetings and events from morning till night. More than 600 citizen volunteer lobbyists traveled on their own dime to be part of this historic effort. In three days of lobbying, this incredible team had more than 520 meetings with members of Congress and their staff, as well as meetings at the World Bank and with stakeholder organizations. If you have never gone to Capitol Hill, to speak with your government, you will likely not understand the power and the beauty of this experience. Conventional wisdom tells us that government is unapproachable and disinterested in the lives and ideas of ordinary people. In fact, the United States Congress is open to constituents, and the people working there are generally eager to hear from the people they represent. The transition to a clean energy economy requires a number of significant changes to the status quo. Most central to motivating the transition is the project of revealing the hidden costs associated with how we get energy from carbon-based fuels. As it stands, the whole of civilization and a vast web of natural systems are financing the business model that makes lots of money for a few people and provides us with what appears, due to pervasive market distortions, to be cheap energy. The market fails in this way, because costs remain hidden from view. Consumers, businesses, investors and public policy planners cannot make appropriate decisions about cost efficiency, because they cannot see the costs in dollar amounts.